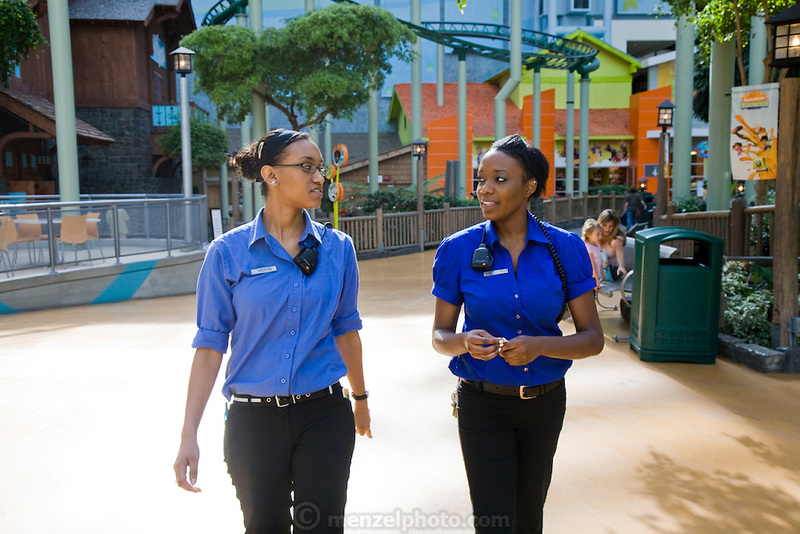 Tiffany Whitehead,(at right), a student and part-time ride supervisor at the Mall of America amusement park, goes on a routine check of the mall with a colleague in Bloomington, Minnesota. (Featured in the book What I Eat: Around the World in 80 Diets.) The Mall of America is the largest among some 50,000 shopping malls in the United States. In addition to a huge amusement park, it houses over 500 stores, 26 fast-food outlets, 37 specialty food stores, and 19 sit-down restaurants, and employs more than 11,000 year-round employees. In excess of 40 million people visit the mall annually, and more than half a billion have visited since it opened in 1992. Tiffany's job involves a lot of walking. Her main beat is the amusement park area, where she responds to radio calls regarding stalled rides and lost children and answers visitors' questions.